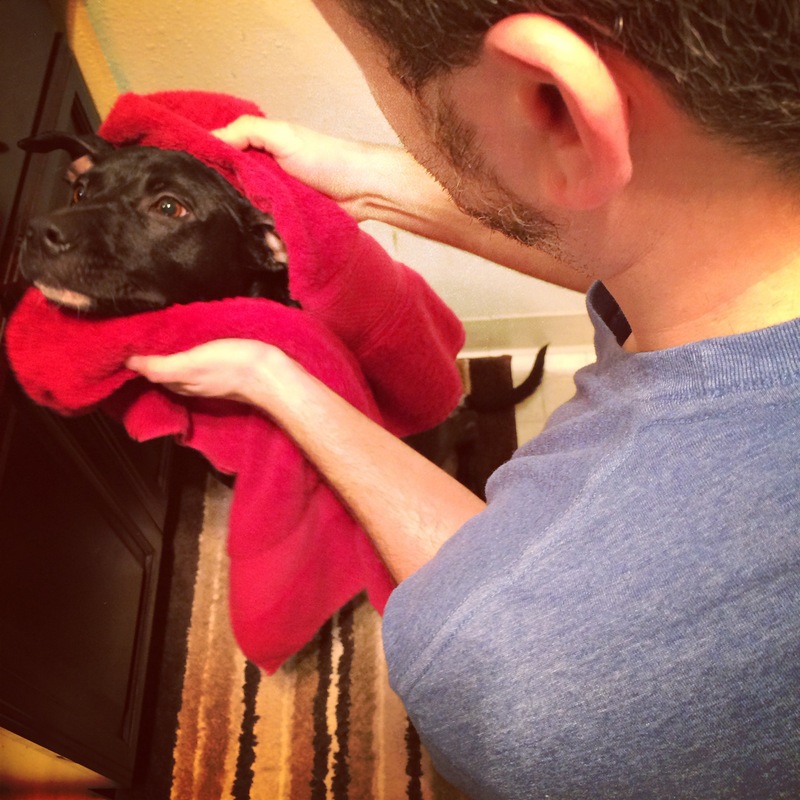 Over the weekend Bella had her first at home bath! Last time she had a bath I took her to a groomer. 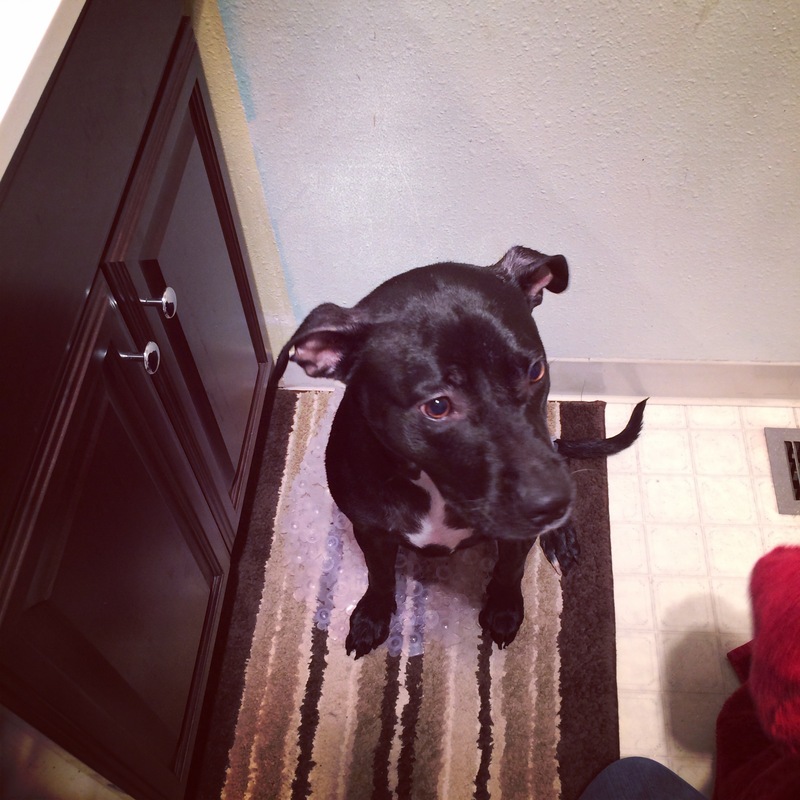 Mostly because I had no idea how to wash a dog and also, I was lazy. But paying for that on a regular basis was going to add up fast. I bought some nice dog shampoo (with green tea and tea tree oil because she has some dry skin issues) and then Michael and I debated on how to bathe her. 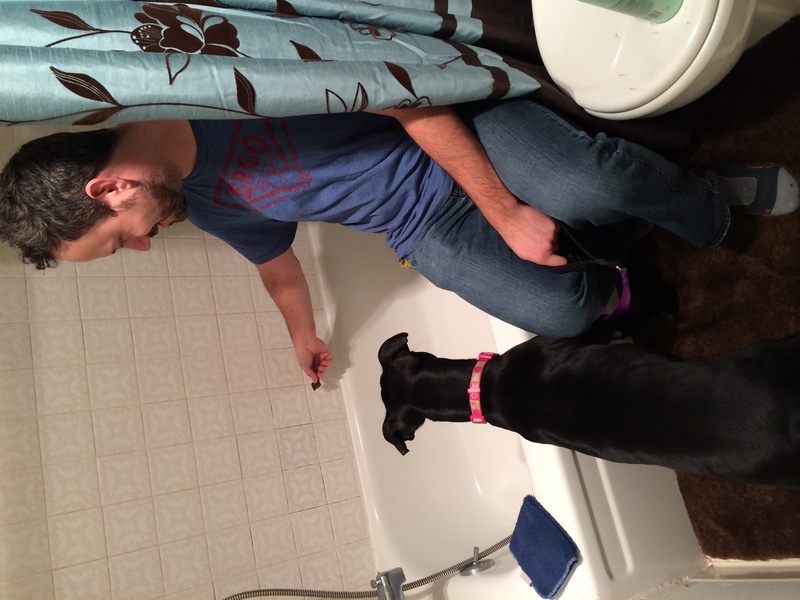 We tried luring her into the tub with treats and she was having none of that. In the end I just picked her up and put her in the tub. 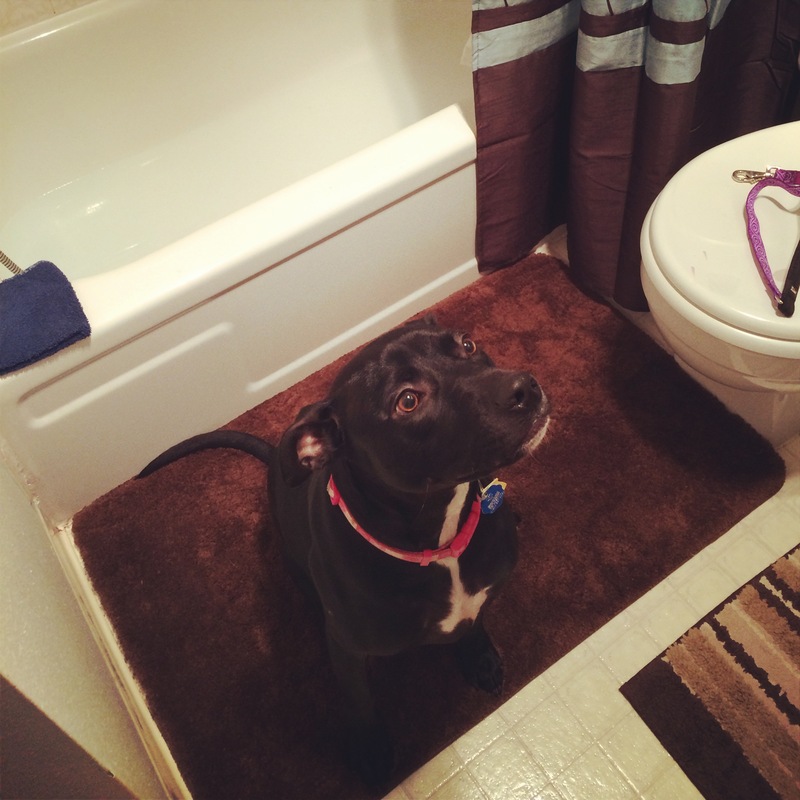 Michael held her collar and leash and I used the detachable shower head to get her wet. She did so well! She didn’t freak out at all! Not like her first time at the groomer. I shampooed her (super quickly) and she actually seemed to enjoy the little mini massage she was getting. I rinsed off the soap and we were done! She did a fantastic job sitting still while we dried her off. Her collar got wet so we took it off to dry. She ran around the house looking naked with the collar — Michael commented that it was like a little toddler running around the house naked after a bath. It was so weird to see Bella without it. She smelled so good! Like a clean puppy. 🙂 While she was overdo for a bath, there was an other reason for it. Her foster mom Jen was coming over for a visit. She hadn’t seen Bella since we adopted her and I was more than happy to have her come and play with Bella. I knew both her and Bella would be ecstatic. Bella barked at her once when she first arrived and then realized “OH MY GOSH it’s my other mom!!! !” She was SO FREAKING EXCITED. Words cannot describe just how spazzy Bella was for the first hour or so that Jen was there. It was so cute. 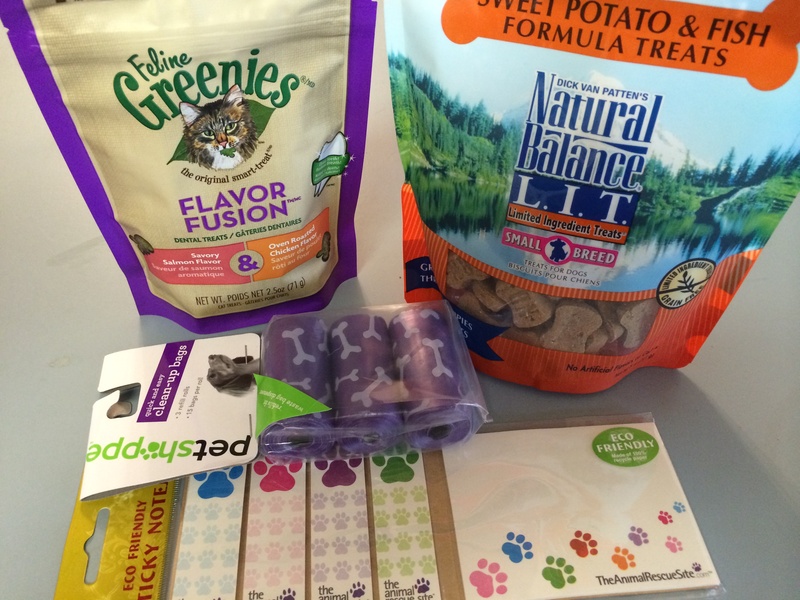 Jen also brought a little gift baggy of dog treats, poo bags, and a new squeaky toy. It was so good to see Jen! And Bella was so happy to see her, too. It was a nice way to spend a Sunday. I also decided to make a crockpot dinner just in case Jen wanted to stay for dinner, then we’d have tons of food, but she had to go so oh well–more leftovers! I’ve been stockpiling some crockpot recipes and just haven’t gotten around to actually doing them. This one has been on the top of that list for awhile now. I love chicken teriyaki. It’s a fantastic dish but often times it’s way too sugary. This recipe looked good on paper. Unlike many recipes I saw, it didn’t call for a cup of sugar or 1/2 a cup of honey. That’s just too much! Place chicken breasts into a slow cooker. 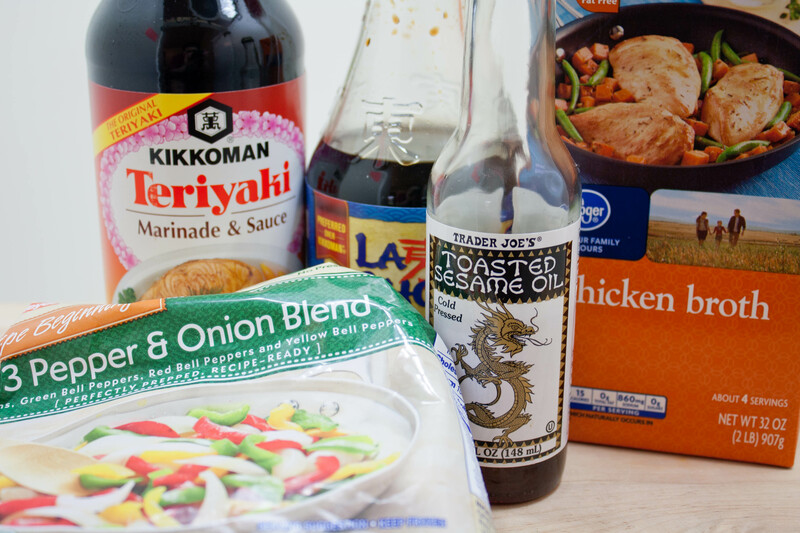 Add teriyaki mixture and gently toss to combine. Cover and cook on low heat for 3 hours and 30 minutes. 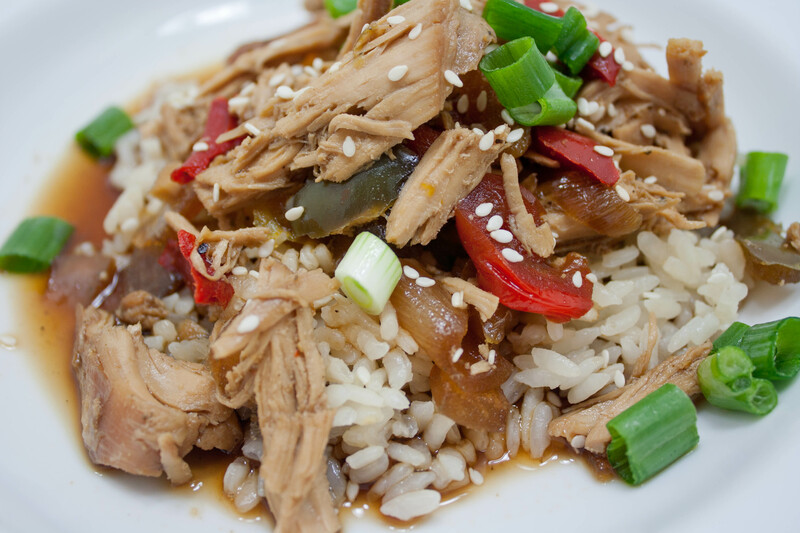 Remove chicken breasts from the slow cooker and shred the chicken before returning to the pot with the juices. Cover and keep warm for an additional 30 minutes. I didn’t add the frozen veggies until later. I let the chicken cook for about 2.5 hours, then checked on it and flipped the chicken breasts over and let it cook for another 30 minutes before adding the frozen vegetables (they had thawed out for awhile). The chicken didn’t take quite as long as the recipe said it would. Around the 3 hour mark it was looking pretty cooked. I took the chicken breasts out and shredded them then returned it to the crockpot. So 3 hours or so is the sweet spot for the recipe. I turned the rice cooker on and let the shredded chicken soak up the sauce. I was glad I added the veggies to the dish. It made a difference. The chicken was tender and flavorful. It didn’t really taste like teriyaki though, mostly soy sauce. I think next time I’d experimenting with using less soy sauce to see if there was a difference. Despite that, dinner was delicious. I loved it and so did Michael. Will definitely make this recipe again! Deb recently posted..Monday Day 877 Grocery Time! Yeah she is so dang cute!!! I love her so much! Adorable! If it helps at all, we wash Pip outside with a garden hose. Yeah, it’s cold but it is a lot easier. When we’ve done it in the tub, she has a hard time with the tub getting slick and then the drain clogs. 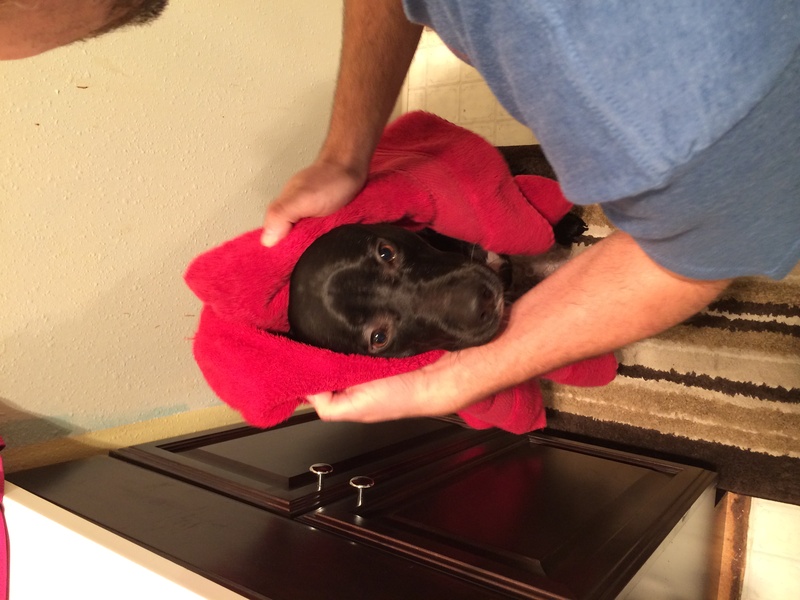 And she thinks drying her off is a game and always tugs at the towel and gets riled up. It’s fun but not very easy. Word to the wise, I threw out my back picking up Cady to get her into the bath so just be careful. Your weight-lifting history will help. 🙂 I also carried her up a flight of stairs which was a very bad idea. Then we started taking her to a Do-It-Yourself place that was under $20. It was worth it. I bathe Max in the walk-in shower with the hand-held. He tolerates it, but he doesn’t run around afterwards “air-drying” as we used to call it when Cady did it. Nothing like a good smelling puppy! EEEK hope your back is ok.
We also have a walk in shower with glass doors and detachable shower. We considered that but that would have required one of us to strip down to a swimsuit or something to get in there with her. She is so cute!!! Like super adorable cute!! I love that the foster mom still visits her. Sounds like a good foster mom. I have used the hose on my oldest dog outside during the summer. Less anxiety for her since she doesn’t like closed in spaces. But she is really trained. She will sit and stay as told. My shiba inu won’t. So now we take them to our local dog store and they have big bath tubs with leash holders and LOADS of shampoos to try for only $12 a dog. A lot cheaper than grooming and that way your tub doesn’t get all icky. Also it helps to have the leash holder so if they squirm a bit it doesn’t matter. I love my dachshund because she is tiny enough to stick in the shower with me while I bath. Much easier than the big dogs. That dinner looks AMAZING!!! I might have to try that recipe soon without the rice. Do you think it would still be good without the rice? Thank you! I think she’s pretty cute too. 🙂 I’ve seen those do it yourself grooming places and I’ve considered trying it. But Bella did so good that I don’t think doing it at home will be too much of an issue. The recipe was delicious. If you don’t want rice, you could use quinoa. Or put it on a salad, or in a wrap. For lunch I had leftovers on top of my salad. I don’t know a lot about dogs but I bet that was super awesome to see Bella reunite with her momma for awhile! 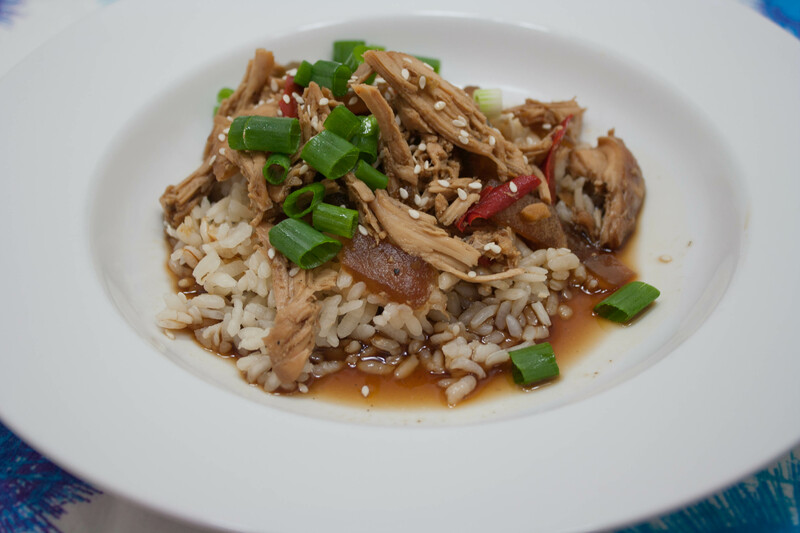 And, I love crock pot recipes – will definitely have to try this one! Her foster mom is great! And she even offered to dog sit Bella while we’re on our honeymoon (so grateful for that!!). and I WAS JUST wondering if we could wash Charming in the tub not outside. Carla recently posted..I’m running a half-marathon (AKA practicing what I long to preach). I got some dog shampoo that is made with green tea and tea tree oil. It was super gentle and seemed to work great. Bella sometimes has dry skin and she doesn’t now. Cute pup! They are so funny in the bathtub. Hahaha! I bet that’s a hilarious sight! I am in love with Bella! So freakin’ Cute!! !